Our members are so incredibly talented and motivated. They're out there hitting the pavement and carving out their own performance opportunities and finding ways to create opportunities for themselves and other dancers. Join Broadway Dance Center for a very special 3-hour workshop, brought to you by Brian Thomas Films on Saturday, April 27! You’ll also meet Award-winning author and fellow Answers4Dancers member, speaker, coach, and choreographer Amy Jordan, as she reads portions of her new book Dance Because You Can. Run over by a New York City bus in 2009, the movie unfolds Amy's heartfelt return to the dance performance stage with her professional company The Victory Dance Project. This after the near loss of her leg and her life. Also included is a chance to get a special preview of never-before-seen footage from Amy's Victory Dance, the first feature film by Emmy-nominated and Award-Winning director, Brian Thomas. Brian is a two-time Emmy Nominee and Award winning director. He’s best known for his work with Michael Jackson, Liza Minnelli, Pink, Usher, Jamie Foxx, Beyoncé, Chita Rivera, Paula Abdul, among other icons. We've got incredible news! 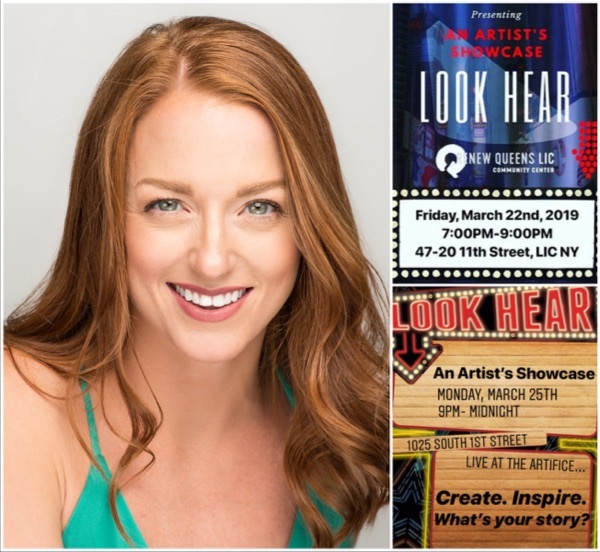 A4D member Holly Dayton is holding two of her Look Hear Artist's Showcases; one in NYC on March 22nd and a second one in Las Vegas on March 25th. Holly created Look Hear with the intent to bring healing to the community by providing love, support, and encouragement for performers. Holly explains it this way: ‘What we do as artists, is quite difficult, to be honest. The lives we choose and the path we're on is not easy. In New York, it means facing countless no’s, hours waiting on the street to be seen at an audition, and working long hours at a side job. In Las Vegas, it means being in a show for several years but being artistically unfulfilled. Or perhaps, fighting feeling stagnant and settled in your craft. The next Look Hear events will mark the 6th one in Las Vegas and the 2nd in NYC. The bonus is a community is being built and encouraging friendships are being formed. Here's your chance to join Holly on Friday, March 22nd at Renew Queens (47-20 11th Street, Long Island City, New York) or Monday, March 25 in Las Vegas at the Artifice (1025 South 1st Street Las Vegas, Nevada). Each event will be a night of celebrating the beautiful talent and creativity of the community; a night to encourage and lift up one another. Holly's mission? Be Inspired. Get Creative. What is your story? CELEBRATE BLACK HISTORY MONTH WITH GREGORY! 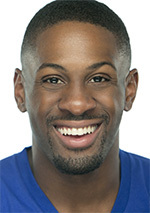 The new company, Progressive Theater, is the vision of A4D’s Dancer To Watch, Gregory Omar Osborne. Its goal is to tell stories that empower the misrepresented; people of color and women, and to captivate all audiences with the focus on the change we want to see in the theater community. 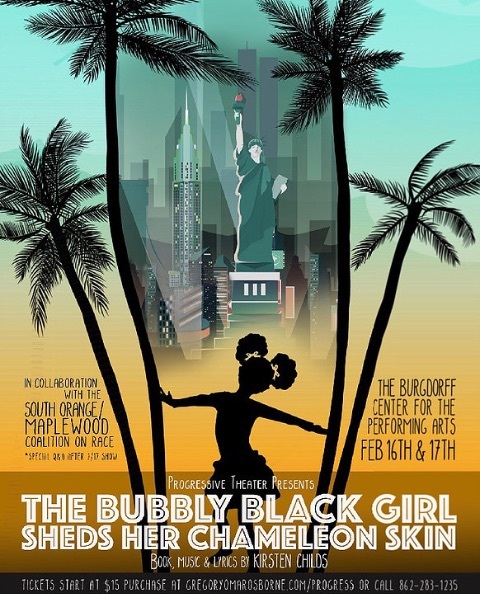 To celebrate this goal, Progressive Theater is proud to present the The Bubbly Black Girl Sheds Her Chameleon Skin in honor of Black History Month, February 16 and 17. The production will tell this story with a mostly black creative team. It is being produced in collaboration with the South Orange/Maplewood Coalition on Race. The musical is directed by Broadway's Jasmin Richardson and features book, music, and lyrics by the Lortel and Drama Desk nominated Kirsten Childs along with choreography by Gregory. The story is told in a span of thirty years: What’s a black girl from sunny Southern California to do? White people are blowing up black girls in Birmingham churches. Black people are shouting ‘Black is beautiful’ while straightening their hair and coveting light skin. Lead character Viveca Stanton's answer: Slap on a bubbly smile and be as white as you can be! In a humorous and pointed coming-of-age story spanning the sixties through the nineties, Viveca blithely sails through the confusing worlds of racism, sexism, and Broadway showbiz until she's forced to face the devastating effect self-denial has had on her life. Bring some fun into your life during Black History Month and get your tickets today for The Bubbly Black Girl Sheds Her Chameleon Skin! Warning: Strong language is used in our production. We want to maintain the integrity of the script and will not change its wording. The show runs from December 20 to 23, 2018. Tickets are available at GregoryOmarOsborne.com. Kelly Vaghenas traveled to Ethiopia and Kenya this summer and has an amazing story to share. We featured Kelly in our September 17 DanceBlast, but here's the full story of her African adventure in her own words. Every year I like to take an international trip, to experience a culture different from my own. For months, I’d been planning on visiting Ethiopia. (I am here now!) I Googled dance opportunities in Ethiopia and East Africa, searching for volunteer programs and dance studios. An article on Dance Centre Kenya (DCK) caught my eye. It told of the journey of its founder, Cooper Rust, a woman from South Carolina who danced with Nevada Ballet, in creating the complex of three studios (and growing) in Nairobi. Cooper first visited Kenya to teach school subjects in the Kibera slums and within a few years she had decided to move to the capital to create a school to provide formal dance training. She has fundraised tirelessly to sponsor several students from Kibera to take dance classes and to attend private school. In the late winter I reached out to her, on Facebook and via email, sending my resume and asking if I could visit DCK to help in any way needed. I was so pleasantly surprised when she asked if I’d like to teach at the summer intensive, the last week of August. Kenya borders Ethiopia, so I knew it’d be a short, not-too-pricy trip there when I finished teaching. I immediately agreed and the wheels started turning for my first experience of teaching dance abroad. In the summer of 2012, after my sophomore year of college, I had interned with a Swedish NGO and assisted with dance, singing and songwriting workshops in Amman, Jordan; but this time, in Kenya, I’d have greater autonomy. Cooper made the schedule for the summer intensive, and I was slated to teach jazz, contemporary, and modern classes, spread across three different ability levels. I created tailored playlists on Spotify and entered lesson plans into a notepad. I arrived at Jomo Kenyatta International Airport at nearly four in the morning, and Silas Ouma, DCK’s African dance teacher and one of its advanced students, picked me up. I stayed at Cooper’s apartment in Nairobi, and throughout my week-and-a-half there, DCK students, friends and supporters came over to enjoy dinners and movie nights together. Monday started my week of teaching, and over the weekend Cooper had invited me to work with select DCK Company students to choreograph for the studio’s next show, in October. I gladly accepted. After teaching my classes every day, I held rehearsals for two different groups, a younger and an older cast of dancers. I chose modern to be the genre of dance for my choreography, as the students don’t yet have modern in their regular curriculum, and practicing and performing it would be a wonderful continuation of what they had learned from me in class. For the younger group, I created a piece from scratch, and I reworked a piece to set on the older dancers. The former uses principles of modern dance technique and has a lyrical touch; the latter is a representation of my quirky choreographic style. The dancers and I got closer during these rehearsals, even with the time constraint. I was so proud to have finished two pieces for new students in under one week. They need polishing, of course, and I wish I could be there through the show in October. I plan to stay abreast of the progress via email and phone apps. However, I trust them to rehearse the pieces and bring them home, so to speak. They were my gift; they are theirs now. We were pleased to announce that Gregory Omar Osborne producied his very first show, Five Guys Named Moe. He's hoping to see many Answers4dancers members so he can share in the excitement of his first production as the Producer. Here's some inforomation so you can get your tickets and be part of the fun! There are four shows, Friday, June 29, two shows on Saturday, June 30, and the final show will be on Sunday, July 1. You can buy tickets online. Click here for more details. 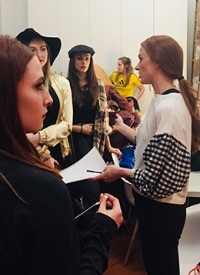 HOLLY DAYTON who is one of our A4D Leaders recently produced her LOOK HEAR showcases in Las Vegas for five years, and now she's presented her first event in New York City on February 18, 2018. Check out this LOOK HEAR ARTIST'S SHOWCASE promo video and please plan to be there on February 18th. You might want to contact Holly directly to become one of the performers. Why not just go for it and share your talent in a showcase created by a dancer for dancers and artists looking for a place to express themselves! One of my favorite quotes is from Erma Bombeck. "When I stand before God at the end of my life, I would hope that I would not have a single bit of talent left, and could say, I used everything you gave me." This quote has echoed in my brain as I have pursued my passion for the arts and as I have pursued what I would term as my calling. Ironically enough, I studied finance in college and almost gave up dancing upon graduation. I luckily had a close mentor that wisely advised me to continue pursuing my passions. I am very thankful for that! Throughout my journey, Answers4dancers has been a source of encouragement, inspiration and much needed advice. I started my career in L.A., transitioned over to Las Vegas for 5 years, and now have lived in New York City for a year. And I have found on my journey, that in all three cities there are common threads in artists and performers. There is an innate need to create. There is an innate need for love and support as they pursue their difficult journey. And there is an innate need for their voice to be heard and understood. Knowing these needs of the artists around me and my personal passions, I founded Look Hear Artist's Showcase in February of 2015 in Las Vegas. I can honestly say it was one of the most inspiring nights of my life. I witnessed brilliant talent supporting other brilliant talent. It felt as though the ceiling of the venue would explode from the amazing energy that surrounded me. It was breathtaking to see and take it all in. What is Look Hear, you ask? Essentially, Look Hear is an Artist Showcase that is designed to connect the artistic community and inspire creativity. It is a platform that gives people an opportunity to create something new using the talents they have been given and perform in an environment that is judgment free and supportive. It is open to all art forms- dancing, singing, spoken word, musicians, etc. I hosted several Look Hear Artist's Showcases in Las Vegas and I did notice a greater sense of community amongst my peers and also a greater satisfaction and sense of fulfillment in people's lives, including my own. I do believe often we are more at peace with our lives when we are able to be understood by others and able to be creative. I moved to New York City a year ago. I can honestly say this past year has been one of the most challenging and yet rewarding chapters of my life. This city is a beautiful thing that pushes and stretches you beyond what you think are your physical, mental and spiritual limits. I am grateful to be here. I lately have felt a deep ache to perform and create myself. This is what spurred me to bring Look Hear Artist's Showcase to New York City. I believe the event could really help local artists cope with the needs to create and to be heard in a very busy and distracting city and time. I believe the event can help artists find a sense of peace in finding their own voice. Please join Holly on Sunday, February 18th from 7-9PM at Renew Queens (47-20 11th Street, Long Island City, NY 11101). It will be a night of celebrating the beautiful talent and creativity of the Big Apple. It will be a night to encourage and lift up one another. Be Inspired. Get Creative. What is your story? Save the date for Dancer To Watch Gregory Omar Osborne's one-man show coming March 24, 2018.